Services - Houston & Harris PCS, Inc.
We offer CCTV inspections of Sewer Lines, Storm Drains, Culverts, Remote Lines, Manholes and Water Lines from 4” to 120". All of our video units are equipped with the latest technology to offer the finest picture quality available in the industry including the capabilities of digital capture in MPEG and JPEG format. Every camera has the ability to pan and tilt to provide the best view of defects and lateral connections. All video operators are PACP/MACP/LACP Certified. This universal coding system is capable with WinCan, ITpipes , PipeLogix and POSM surveying software. In addition each operator is instructed per project according to your specific needs. Daily production figures range between 3000 - 6000 linear feet per day depending on the criteria for inspection and condition of the pipe. Quality along with production has always been our goal. To insure the highest quality product is delivered to our client our quality control department is also responsible for data tracking, implementing databases, creating observation codes, establishing fully integrated rating systems and complete operator training. 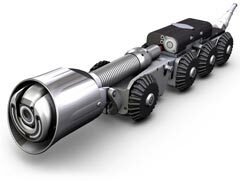 The ROVVER X SAT crawls 500' down mainlines 6" and larger, and then inserts its camera 100' into laterals as small as 4". Its auto-leveling color camera with shadowless LED illumination pans and tilts to capture exceptional sidewall detail. An integral sonde transmitter (available in standard frequencies) makes locating the camera from above ground quick and easy. The system is also equipped with a rear-view camera, auxiliary lamps and steerable 6-wheel drive — essential for maneuvering to troublesome launch points. The SAT camera, crawler, and push reel are compatible with the ROVVER X crawler reel and desktop controls. Agile. ROVVER X SAT's lateral camera pans 360 degrees and tilts 90 degrees, capturing maximum detail from pipe walls. Detailed. Twin arrays of shadowless LED illumination combine with an auto-upright camera to ensure maximum detail. Rugged. The SAT camera head is stainless steel and carries a 1-bar pressure rating. Simple. The ROVVER X SAT camera and cable detach easily from the crawler. A rear-view camera facilitates reverse travel. The positioning launcher can be replaced quickly an inexpensively when worn. Reliable. A software-guided launcher monitors pushing forces during launch so as not to damage the push rod. ROVVER X SAT's stainless steel camera withstands punishing conditions. Integrated. ROVVER X SAT uses the standard ROVVER X desktop controls, and requires no additional control unit or power supply. The push reel simply plugs into the crawler reel for all power and control connections. 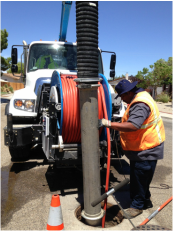 We have the ability to clean the following: Wet Wells, Dry Wells, Sand Filters, Catch Basins, Culvert Boxes, Storm Drain, Sewer Lines, Lift Stations, Utility Pot Holing, CDS Units and Water Lines. Our operators are individually trained by senior staff members to ensure proper handling of all equipment. Our combination units can deliver water to the nozzle at a rate of up to 100 gallons per minute. Each vehicle can carry the necessary chain flails, root saws and high pressure nozzles needed to completely clean and remove debris. H & H uses new generation cleaning nozzles that meet our stringent requirements and not simply industry standards. Portable debris boxes are available for locations without dump sites in order to comply with EPA, SSMP, and BMP standards. The cured-in-place pipe (CIPP) lining is a process to rehabilitate exisiting sewer pipes, due to age, cracks or leaks. The pipe lining process is a three step process. Cleaning and Inspection, Pipe Lining and Reinstating Laterals. Allows for pipes to be rehabilitated in place of traditional replacement that requires excavation and disturbs the surrounding neighborhood and businesses. Less expensive than replacing the pipe. Allows for an increased sewer flow capacity. Has a 50-year design life. Is completed in 1-3 days versus 6-9 months for traditional pipe replacement construction. We provide a quick and easy way to look down a pipe. This unique inspection camera is perfect for manhole, vessel and tank inspections as well as for large diameter piping and confined spaces. The color camera is remotely controlled and features 12x zoom with lighting user select-able between flood or focused beam. Pole Cam is a complete compact unit including the camera lens, lighting and control receiver on a 17' extendable pole. The upLink™ pole-mounted viewer/recorder presents real-time footage on a 3.6” color LCD, and stores up to 16 GB of video and still images on a micro SD card. The screen undocks for wireless viewing/recording. An auxiliary manhole camera with diffuse lighting captures wide-angle views with the flip of a switch. A rugged, waterproof roller case with telescoping handle stows all system components in one convenient kit. 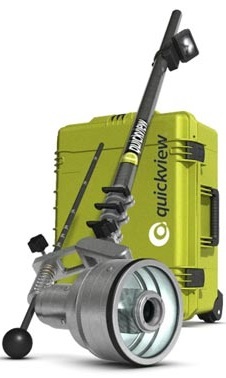 Now more than ever, QuickView is your choice for rapid, complete and cost-effective survey of underground infrastructure. VeriSight Pro's digital interface displays real-time inspection footage on an 8" LCD, records up to 90 hours of inspection video to internal memory, and allows an operator to enter observation data for upload directly to WinCan. An intuitive, customizable interface grants the ability to zoom 3X on live or recorded video, capture still images from live or recorded video, configure the 16-page text writer, browse thumbnail galleries, and select among several available languages. VeriSight Pro comes in standard lengths of 130', 200' and 330'. Measuring 1.62" diameter, its stainless steel camera head with high-sensitivity imager and shadowless LED lighting inspects pipes 2–9". An integral tri-band sonde transmits at 33 kHz, 512 Hz or 640 Hz. The entire system runs off mains power, vehicle power, or an internal rechargeable 6-hour Lithium-ion battery. Comes in 130', 200' and 330' lengths. Records up to 90 hours of MPEG4 video in internal memory (expandable to 128 GB). Captures JPEGs from live or recorded video. Zooms live or recorded video up to 3X. Offloads footage/data via USB or SD/SDHC card. Displays footage on 8" TFT LCD (800x600). Captures crisp footage using high-sensitivity camera with shadowless illumination. Tri-band sonde works with most locators.